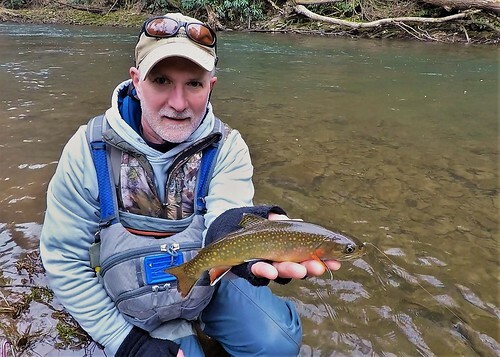 John Mullican spent a brisk January day fly fishing on the Savage River, and takes one last look at a beautiful brook trout before releasing it. Photo by John Mullican. Maryland is home to a relatively small fish that inhabits only streams with the best water quality. It’s a beautifully colored fish called the brook trout, Maryland’s only native trout. He is feisty, guarding his territory during the fall breeding season. Anyone who has caught and handled a brook trout or seen one holding in a stream often feels they have been touched by a wonder of nature. Read more about Maryland’s brook trout program online. 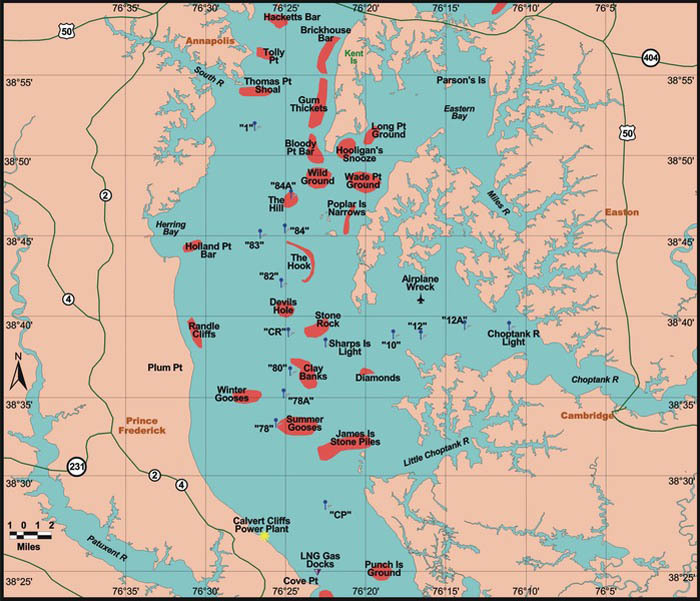 With Chesapeake Bay water temperatures in the upper 30s, bay fish are currently at winter holding areas. With plenty of cool waters and oxygen from surface to bottom, anglers can look for concentrations of fish in some of the remaining warm water areas. 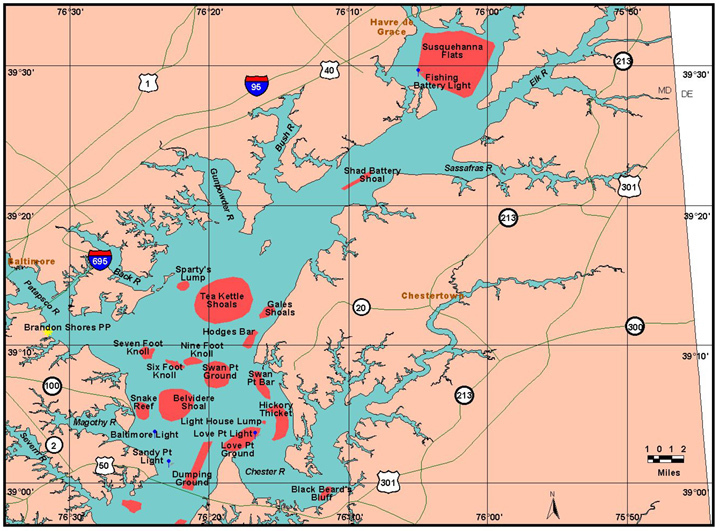 In the main bay, these warmer bottom waters deeper than 50 feet are located from the Bay Bridge south to near the Maryland state line, in areas with good structure and protection from strong current such as underwater points, channel edges, and bridge pilings, along with nearby oyster bottom and reefs. The other warm water areas to consider are near the water discharges of your local power plants. 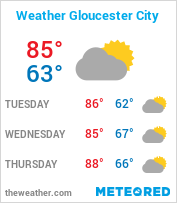 Weekly bay fishing conditions forecasts will resume again in March. For those hearty cold water anglers, all water conditions maps, plots and satellite pics will be continuously updated and posted. For detailed, up-to-date fishing conditions in your area of the bay, continue to check out Click Before You Cast. Most of the focus in this area will be in the middle to upper reaches of the region’s tidal rivers. Fishing for yellow perch will be on the top of the list for those seeking a quiet spot along a narrowing section of water with some considerable depth. There is also a mixed bag of crappie, large bluegill sunfish and channel catfish and the occasional largemouth bass. One of the most effective ways to fish is with a lip-hooked minnow on a very small jig head, often around 1/16 of an ounce. 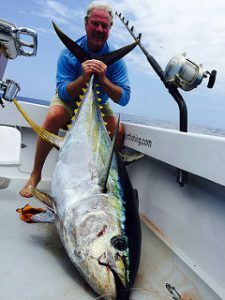 This calls for light line, and many have found that braid in the 6-pound range can offer the distance needed when casting a light offering out across open water from shore. Another option is to lip-hook a minnow and place an appropriate sized split shot about two feet up the line from the hook. Either of these rigs should be allowed to sink to the bottom and worked slowly along the bottom with frequent pauses. For those who just want fish for an hour or so and don’t have the time to purchase minnows and transport them there is another option. Placing a small piece of red felt on a small jig and a drop or two of anise flavoring or your favorite fish scent on the felt often works well. Just remember that the yellow perch are feeling a bit chilly holding in the deeper holes in the upper stretches of spawning creeks and rivers, and tend to be lethargic. Surface water temperatures in the tidal rivers and creeks is presently in the low 30s. The pickups will be subtle and often when you pause during a very slow retrieve. Some of the places to give yellow perch fishing in the upper bay region include the tributaries of the Bush and Middle rivers, the Northeast River, the Magothy and the Eastern Shore rivers down to the upper Chester. There is a deep hole in the lower Susquehanna River near the Perryville Condominiums that is often a prime place to fish, but must be fished from a boat with a dropper rig using up to a two-ounce sinker depending on conditions. Chain pickerel tend to love cold water and are active this month; look for them along shoreline structure such as sunken wood. Most any kind of lure will attract their attention. If a trophy-sized chain pickerel is on your list, try finding structure out in deep water, this is where the big ones lie. Large lip hooked minnows, swimbaits and deep running crankbaits are good choices when looking for the big ones. Crappie will be found holding near deep structure, bridge piers, marina docks and fallen treetops. Small lip-hooked minnows or small jigs under a slip bobber are a good way to catch them. Channel catfish can be found holding deep and can be caught on a variety of cut baits or something as simple as pieces of chicken liver or breast. In the lower Susquehanna River and the Conowingo Dam Pool there are not only channel catfish but also flathead and blue catfish. Yellow perch, chain pickerel, crappie, and channel catfish will provide most of the action in the tidal rivers and creeks. 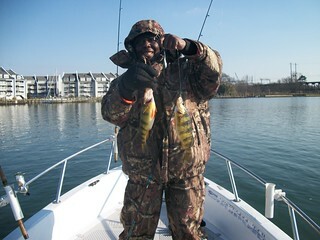 Areas of the upper Choptank, Tuckahoe, and Nanticoke rivers are already providing some exciting yellow perch action for those fishing the deeper areas that may range from 5 feet to 12 feet deep, which are holding staging yellow perch. Chain pickerel can be found in most all of the middle bay region tidal rivers and creeks providing some fun fishing opportunities. White catfish are very active in most of the tidal rivers and can provide plenty of pull. For whatever reason late winter and early spring seem to offer the best fishing opportunities for this species. Channel catfish can also be found in the deeper sections of the region’s tidal rivers. 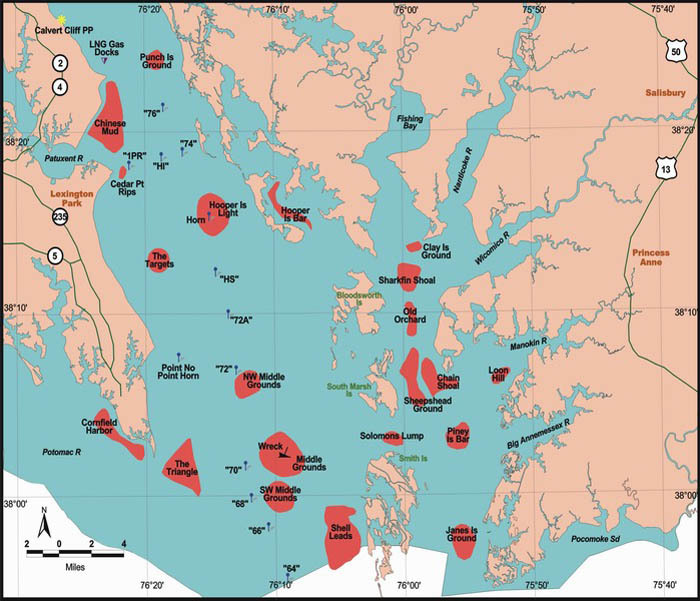 Perhaps the one of the most viable options in the middle bay region for those itching for some striped bass catch-and-release action is the Calvert Cliffs Nuclear Power Plant warm water discharge. If your boat is not winterized and ready to go, a trip over to the discharge on a nice day can offer some fun vertical jigging action for striped bass. In other news, the Dorchester County side of Bill Burton Fishing Pier State Park will reopen for day-use only fishing on Thursday, January 24, and will be open every day from 7 a.m. until sunset. The Talbot County pier is expected to reopen on or about April 1, according to its regularly scheduled spring opening. 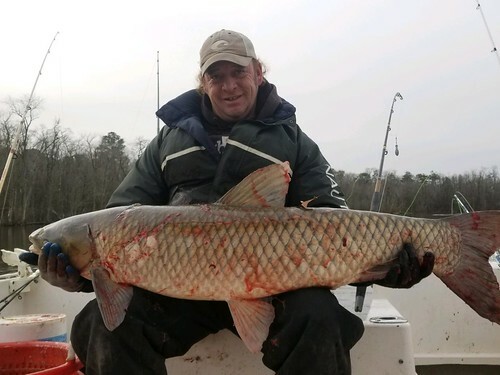 Fishing for blue catfish in the middle region of the tidal Potomac might present some of the most exciting fishing opportunities for the next two months. The blue catfish are stacked in the channels and the largest ones are holding deep. If a trophy-sized blue catfish is on your radar, the deep channels in front of Fort Washington are one of the better places to try your luck. When fishing for the largest blue catfish, a fresh slab of gizzard shad is hard to beat; others prefer live bluegill sunfish or white perch for bait. The smaller medium-sized blue catfish offer the best table fare and can be caught on a variety of fresh cut baits. The middle region of the Patuxent River as well as the Nanticoke also offer good fishing for blue catfish. Sometimes when you’re fishing you never know what you might catch. Crappie are abundant in the tidal portions of the Potomac River around the Wilson Bridge and nearby marinas. The crappie are holding deep around structure and can be caught on small minnows or jigs under a slip bobber. Crappie can also be found in most of the region’s tidal rivers and creeks and many lakes and ponds. St. Marys Lake is a particularly good place to catch them. Chain pickerel are active in the upper sections of the region’s tidal rivers and creeks and can be caught on a variety of lures. Yellow perch can also found holding in staging areas of the region’s tidal rivers and creeks. The Nanticoke, Patuxent, Pocomoke and Wicomico rivers all hold good populations of yellow perch. This time of the year many look to Deep Creek Lake in the hope of some ice fishing opportunities for yellow perch and a mix of walleye, smallmouth bass, bluegills, trout and chain pickerel. 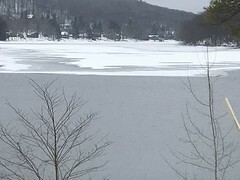 As of mid-January there is a small amount of ice in the coves, and it’s not safe for ice-fishing, but the main sections of the lake remain open. When fishing there, continue to check local conditions and heed all safety warnings! The pre-season stocking of trout in a wide variety of trout management waters is due to begin soon. Anglers will have the opportunity to spend some time fishing for trout in waters often close to where they live. Water temperatures will be cold and much to the liking of the trout. Anglers are advised to keep tabs on the trout stocking websitefor the latest updates. According to Western Region Fisheries Manager John Mullican, the upper Potomac River still has a strong flow but is now very clear. Water temperatures have dropped into the 30s and before the recent cold snap, fishing had been consistent for smallmouth bass, walleye and muskie. Anglers should focus on winter patterns and present baits slowly. Shallow, swift flowing areas are largely devoid of fish during the winter — look for moderate depths with permanent structure that offers protection from the current. Dress warmly and wear your personal flotation device at all times. Despite cold winter temperatures largemouth bass can be found in a variety of waters from small farm ponds to the largest reservoirs and tidal rivers. Most often they will be found holding deep near structure. Steep channel edges, sunken wood, rocks and bridge piers are good places to work a variety of jigs, grubs, crankbaits and blade lures. As long as there is open water and a sunny day, fishing for largemouth bass offers plenty of fun during the winter months. Generally it is a good idea to downsize lures and work them slow and close to the bottom. Most of the fishing action taking place is offshore as boats pick their days to venture to wreck and reef sites in search of tautog. 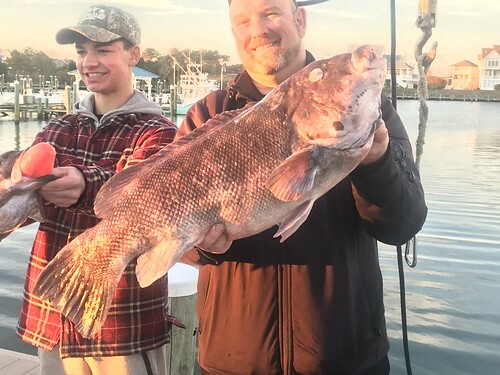 The colder months of January and February are legendary for the chance of catching trophy-sized tautog that can weigh 15 to 20 pounds. The flounder regulations for 2019 have been finalized and the season will run from now through Dec. 31, with a four fish per day creel limit at a 16-1/2 inch minimum length. The sea bass season will begin May 15 and run to Dec. 31 with a 15 fish per day creel limit and a 12-1/2 inch minimum length. Tautog will run from Jan. 1 to May 15 with a four fish per day creel limit, then will not open again until July 1 through Oct. 31 with a two fish per day creel limit. From Nov. 1 to Dec. 31 the four fish per day creel limit will resume. The minimum length for tautog will be 16 inches through all seasons.